After plying his trade at the university level for four seasons, U of M Bisons men’s hockey team captain Brett Stovin is ready for his next test. The 24-year-old is looking to step into the pro ranks following this year’s season. “I have an agent in Denmark right now and he’s doing some work over there,” said Stovin. Stovin is not too familiar with the leagues in Europe but is putting his trust into his agent to find the right fit. “He seems to be on the exact same page I’m on, where he’s a family guy and he understands family,” said Stovin. For now though, Stovin is focused on the season in Manitoba and getting healthy again. Stovin had a hip reconstruction two summers ago and is currently out of the Bisons lineup finishing rehab. “I know I have to get my body ready to go because they don’t have the same resources we have here,” said Stovin. Stovin has the experience to make it professionally and he played for the Saskatoon Blades for four years. Prior to the WHL, Stovin only played house leagues and AA. “My first year in the WHL was a lot of getting yelled at to learn a lot of new things,” said Stovin. While playing for the Blades, Stovin skated in the Memorial Cup. Stovin was a part of a penalty kill unit that got stuck on the ice for a full major penalty to end the second period. “We ended up being stuck in our own end the entire five minutes,” said Stovin. “We blocked a ridiculous amount of shots and the only thing that saved us — they didn’t score — the only thing that saved us was the buzzer at the end of the period. That penalty kill becomes more memorable when Stovin recalls who was on the opposing power-play unit. “They had [Nic] Petan, [Oliver] Bjorkstrand, Seth Jones, Ty Rattie — that was the unit they had together,” said Stovin. Stovin has had some memorable moments at the U of M, but the winter classic at the University of British Columbia sticks out in his mind. The Bisons lost a hard-fought game 4-3. 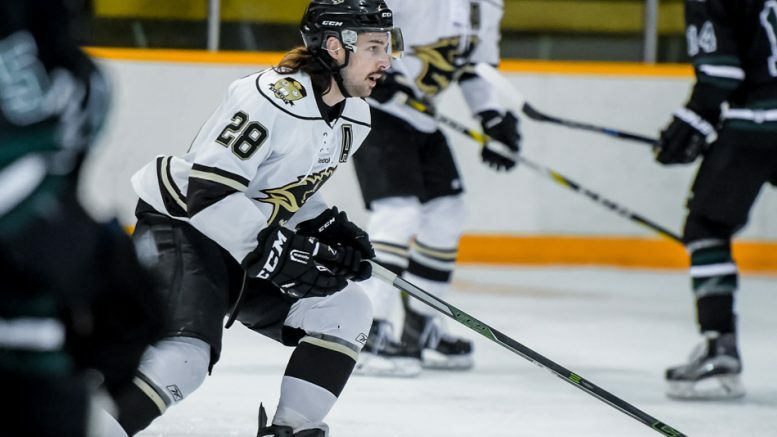 Stovin is captain of the herd for the second straight season and during a tough campaign for the Bisons he has resorted to different tactics to keep spirits up. “At times I’ve even become a prankster in the dressing room and that’s not my thing,” said Stovin. “It’s kind of our leadership group’s way of letting guys know that they need to be accountable, because we have standards,” he said. Stovin said skate blades have been taped, laces have been put in upside down and equipment has been taped together. “On the record, I would like you to say that all of this is Nick Zajac doing that, so that they know it’s not me,” joked Stovin. Zajac and Stovin met when both played for the Blades, and reunited at the U of M.
“We’ve always been able to lean on each other,” said Stovin. “We’ve always been on the same line together, we’ve always been leaders together, we kind of work perfectly together,” said Stovin. Stovin is completing a recreation management major and will finish two classes overseas via correspondence. “Hopefully in the future [I’ll] get a masters while I’m over there playing or see kind of where the puck takes me,” he said. If hockey ever falls through, the Bisons captain has a few ideas career-wise. “Sports management is an option, I’ve really thought about coaching, general management, president of a sports organization, that type of route,” said Stovin. Stovin said he also loves the outdoors and would be interested in working in park management or becoming a conservation officer. “Whether it’s in the rink, or outside in the bush or on the lake, those three places are like my happy place,” said Stovin.